Usually used in the home's interior, pocket doors are doors that “disappear” into a special crevice inside the wall when opened. They are generally top-hung and slide along a track mounted on the ceiling. Some homeowners ask for pocket doors simply because they like the style. Others find themselves in a position where they have to decide whether to include pocket doors in their homes during the design process of a remodeling project. Interior pocket doors solve particular problems and present particular challenges. Find out more about the pros and cons of including a pocket door in your project. Space and clearance. In tight quarters, like a Jack and Jill bathroom, standard swinging doors will eat into the limited clearance space available, gobbling up 10 or more square feet each! Pocket doors solve that problem. Wall space. When open, a swinging door occupies wall space equal to its width (usually 32-36” for an interior door). In small rooms where wall space is at a premium -- for furniture placement, storage, or hanging art -- pocket doors solve the dilemma. Convenience. Sliding pocket doors are useful in designing two separate rooms so that they may be joined as needed. For example: A formal dining room might have a wide opening, equipped with pocket doors, toward an adjacent space. This would enable larger dinner parties to fit in, while still allowing more intimate settings when the door system is kept closed. Aesthetics. Some homeowners simply prefer the elegant, streamlined look and feel of pocket doors -- especially stylish glass pocket doors -- and opt to use them for that reason. Noise, smells, and light. 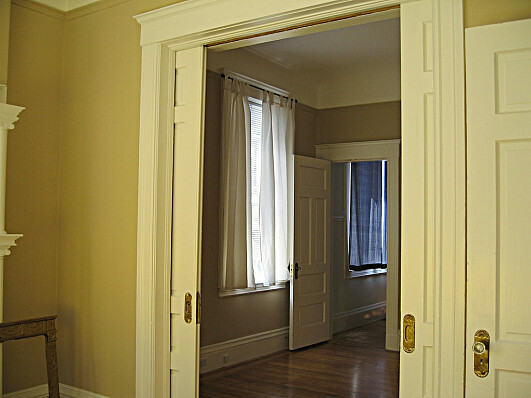 Pocket doors do not sit as tightly as conventional doors. As a result, they are not nearly as effective in preventing noise from traveling from one room to the next. Interior pocket doors are equally poor performers with respect to sealing off a room's smell (think kitchens or bathrooms). Similarly, more light will escape from one space to the other. Wall sturdiness. For a typical 32" pocket door, a wall opening double that size is needed. The opening is covered up with the wall finish material (e.g. drywall) but because that wall section contains no studs, it will be flimsy and tend to wobble. Functionality. Pocket doors are notorious for problems with functionality. They often fall off their tracks, move with difficulty, are problematic to lock, and screech when rolled. Accessibility. Sliding pocket doors are hard to manage for anyone with limited use of their hands, such as arthritis sufferers. More dexterity is needed to slide a pocket door open and shut, using a flush or recessed pull, than to grasp well-designed, user-friendly standard door hardware. Order solid doors. Almost all types of doors may be hung as pocket doors, rather than installed as swinging doors. Solid doors are heavier and thus more challenging to the hardware. However, hardware tends to pull out of hollow-cored composite doors over time. Use pocket doors in 2 x 6" walls, rather than in 2 x 4" walls, if possible. This means that the pocket door opening will be stronger. You’ll also end up with a more solid wall on which to mount accessories such as towel rods. Always specify high quality hardware. Go for heavy-duty ball-bearing nylon rollers, for instance, rather than the cheap hardware typically supplied with pocket doors. This is extra important when supporting a larger-than-usual pocket door, which weighs more. Install good quality door pulls, as well. Ensure that the wall fasteners don’t protrude into the pocket space. Wall fasteners often inadvertently project into the door's path, meaning you’ll need to open up the wall to fix the problem and then repaint the door. Be especially careful if the wall is being tiled (with lathing used). Choose the right person to install your pocket doors. For great results, hire a reliable remodeling contractor who has experience with this type of installation work.